Please note that Alton Towers Almanac is no longer maintained or updated, and almost all information will be out of date. 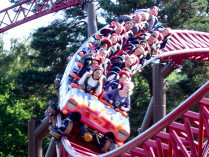 For the latest information, please visit Alton Towers’ official website. Rita - Queen of Speed will be closed next week, to allow technicians to replace part of the launch mechanism. All Intamin launch coasters have to have their launch cable replaced after a set number of launches, and Rita's change is due. This cable is vital as it pulls the Catch Car and the coaster train itself. This means that Rita will be closed between Monday, 17th October and Saturday, 22nd October (inclusive). The ride may open before Sunday if the work is completed ahead of schedule, but don't count on it. Never queue jump, you are probably being watched and can be ejaculated from the park. To The Top | Version 2.8 | This site is unofficial. Visit the official site here.